개발자 : J2WORK Co., Ltd. Thank you Michelle for submitting bug report. by Sarah Trevor, Editor, Cross Stitch Crazy Magazine. 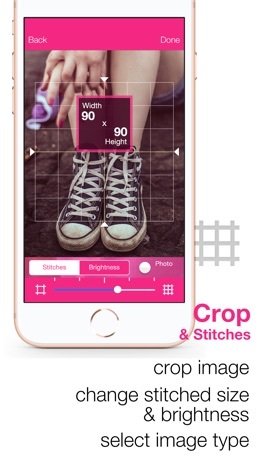 "This is a must have app if you’re into cross stitching, but it’s also a great addition to the photo arsenals of picture editing enthusiasts." "With Cross Stitch Camera connects you cross stitch with modern technology." Now photograph anything anywhere with your iPhone...people, places, or things and immediately create real Cross-Stitch patterns (this is not simply a filter!). Choose the colors you desire using DMC cotton thread, your desired grid size, and thread count. Your pattern appears in easy to read symbols for DMC colors and your thread color table can be saved and printed in PDF format. 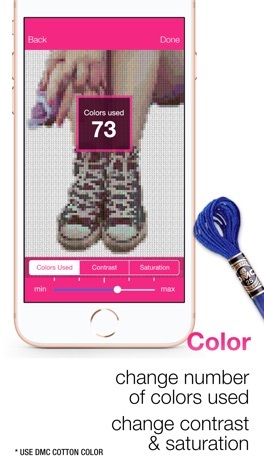 This new App changes your Cross Stitch options and experience. What are you waiting for? 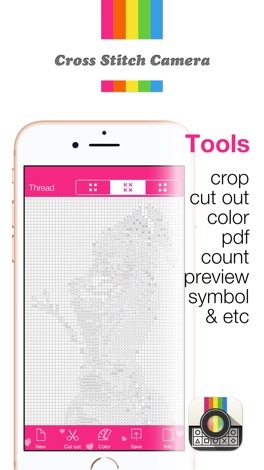 Simply download this amazing new iPhone App today and start Cross-Stitching! 2. Select cut out button to cut out image - out line the part of your image you want to select. Then press contract. *After changing contrast and saturation or cutting, please come back to the color used to change the maximum number of colors. Adjust the desired number of colors again. 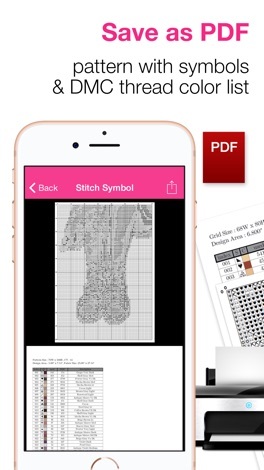 How to save in PDF in Cross Stitch Camera? First you click export button(placed on top right in save windows). Please send an email to yourself or a friend. Then you can find in your mail-box and you can print it later. Or, when you export PDF, if you have any free PDF reader app, you select that app(the icon is appeared). Once it is opened, it is saved on list. In PDF, the patterns(with a lined grid) and color table will be saved.